Megan and Liz took some time to talk to SheKnows and revealed how they wrote a song when they were 10 years old, and performed it live for us. SheKnows was able to get some time with singers Megan and Liz for an awesome interview where the pair talks about a song they wrote when they were just 10 years old. Lucky for us, they went ahead and actually performed it live. When asked by SheKnows’ Lauren Kelly if they ever made any “super-embarrassing” videos of themselves performing when they were younger, the fraternal twin sisters were excited to admit they did. Apparently, during their Thanksgiving holiday at home, the pair found an old video they made as kids. Liz added that her hair was still wet from the shower as she and her sister recorded themselves singing their tune. “We were singing a song we wrote that we thought was just… a hit song,” Megan laughed. The song was called “Goodbye,” which was “very original,” Megan joked before the duo went on to perform their younger days’ collaboration. “Ooh, ooh, you know how to treat me like you should…” the song began. “I had a lot of boyfriends when I was 10,” Megan quipped and Liz added how her sister was “the cool one,” and “the heartbreaker” of the school yard. 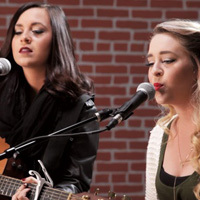 You can watch Megan and Liz belt out their childhood hit on the video above. Megan and Liz discuss growing up without a dad. Check it out.